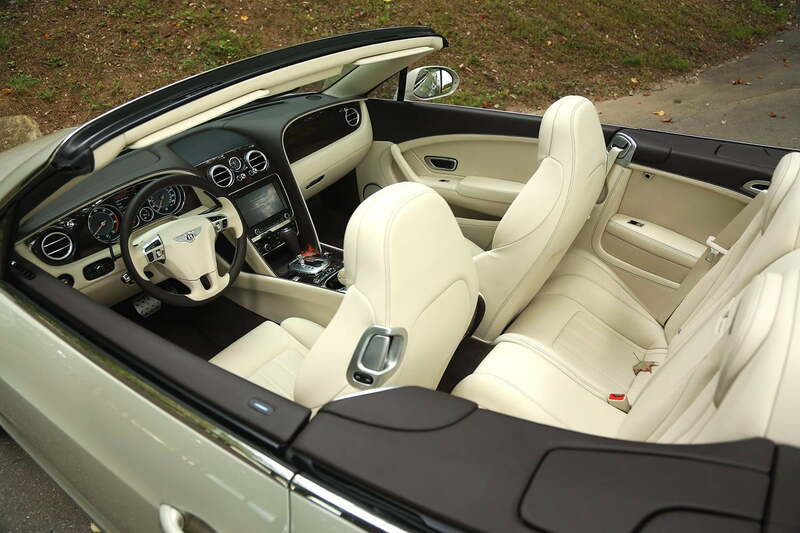 The Bentley Continental GTC is more than just a status symbol - it's an all-weather sports car with craftsmanship worthy of kings. This isn’t going to be the kind of review that rants on and on about specs. If you’re looking for that stuff, take a look at our video review. Truth is; if you can afford the $251,000 sticker on this car, chances are it’s not the only thing hanging around your garage. And since the GTC came with a tender – intended to trickle-charge the battery while the car sits for months at a time – our guess is that the folks at Bentley know it’s a seasonal car, too. Instead, we’re going to talk about what it’s like to get behind the wheel of something so magnificent – and magnificently expensive – as a daily driver. I flew in late from the west coast, which means it was approaching red-eye territory in Atlanta. Filled with anticipation to see this car–and to get home for some much-needed shuteye – I scurried from the B Terminal of Hartsfield-Jackson toward the ground transportation center. The shuttle driver asked for my park-and-fly ticket, to which I said the magic words that essentially mean, “it’s a press car in valet.” His eyes lit up. This would become the theme for the week. Whether we were parked at the grocery store, filling up at the gas station, or walking back from a restaurant, bystanders were seemingly drawn in by the GTC’s gravitational pull. And why wouldn’t they be? The Continental looks as long as a school bus, but as lithe as a sports car – and there’s no question that it’s expensive. The paint alone is some of the richest we’ve ever seen. 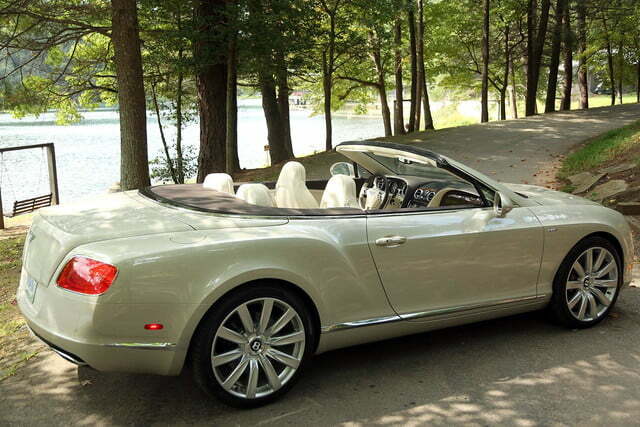 Bentley called this one “White Sands,” and they couldn’t be more right. 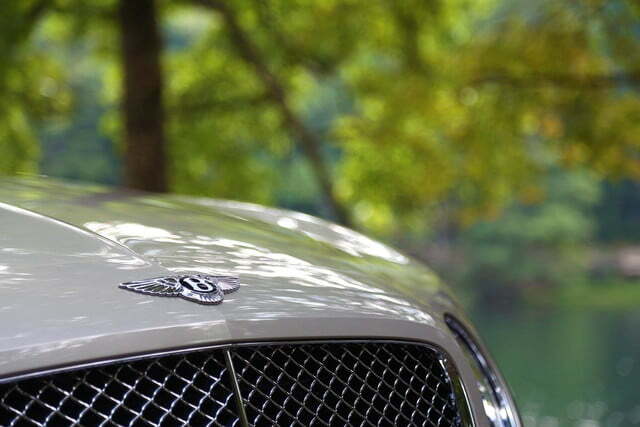 Just about any story is halfway believable when you’re behind the wheel of a Bentley. Picture this. You’re standing on the beach on an island in the Caribbean, waves splashing, breeze pulling softly through your hair. You reach down with both hands to scoop up the soft, white sand under your feet. Looking closely at it, it’s not actually white, but a dozen different colors of microscopic, shimmery crystalline pebbles, reflective with light, that come together to make a color most easily categorized as “white.” Now pour that hand full of sand over flowing sheetmetal, and you’ve found Bentley’s paintwork. There’s not a single harsh line on the exterior of the car. It’s drawn completely in curves. 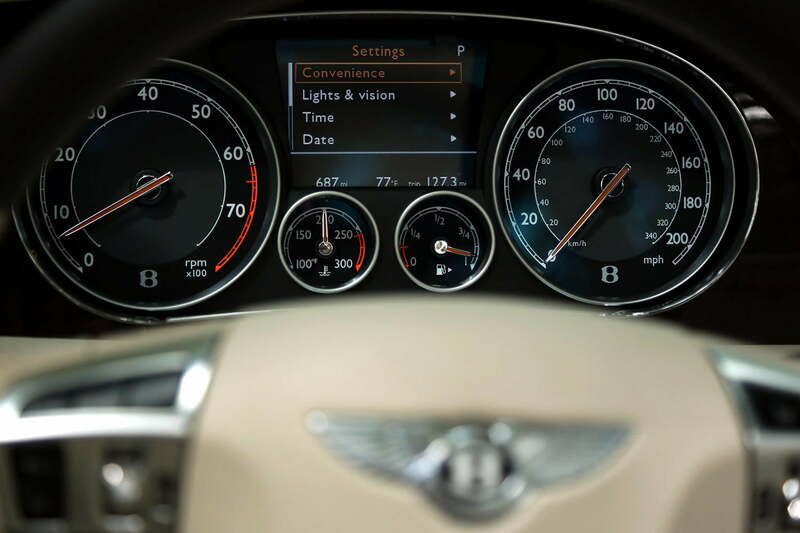 From the front, the Continental is low, wide and broad. It’s not angular with aero-work like so many other sports cars, but rather stately, with reserved, yet powerful design. There are four elliptical lights up front; the outermost containing rings of LED daytime-running lights, and the inner set used for the xenon headlamps. Those lights flank either side of a massive rectangular grille that looks almost as if it’s made from a finely woven strip of platinum dipped in chrome. 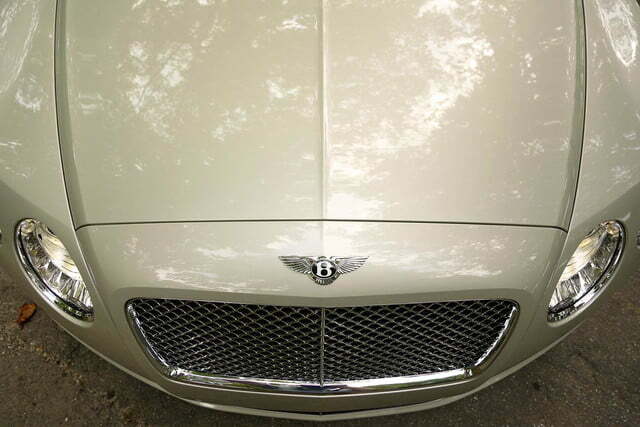 And, of course, the wingéd ‘B’ is mounted squarely above the grille. Move to the rear of the car, and there’s a little more old-world charm. If it weren’t for the LED taillights, the chunky, rounded rump of the GTC could belong to any of those gangster cars from the 1920’s. Its exhaust pipes are narrow ovals, barely noticeable from the rear bumper. Look to the car’s profile, and you’ll find massive, but gorgeous 21-inch wheels, chrome trim, and sheetmetal that crimps to an almost Coke bottle shape in back, but not so much as to hint to American musclecardom. 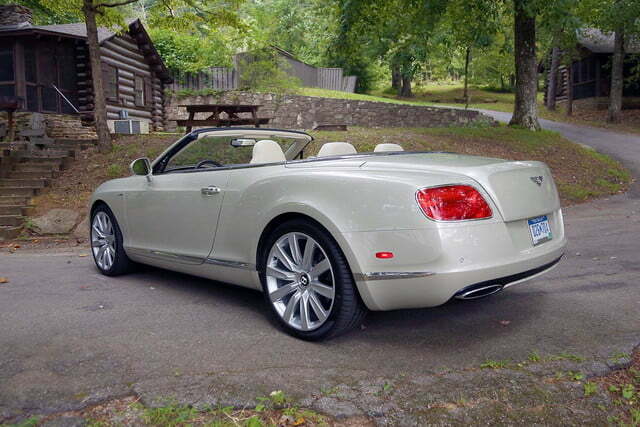 Inside, the Bentley is all leather, wood, and polished metal. 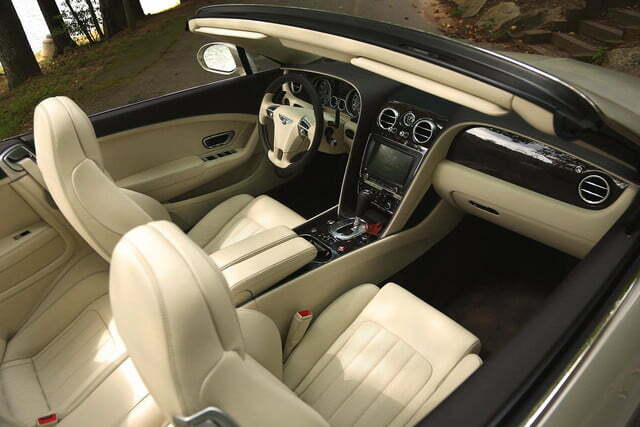 Linen and chocolate colored hides adorn the seats, dash, door panels, console, wheel, and convertible boot. The console and trim pieces are veneered in a dark burr walnut, and its grain matches around the instrument cluster, shift lever, and passenger seat. The round air vents remind us of those found in commercial jets, but trimmed in aluminum. Like so many other pieces of this car, they, too, adjust smoothly like they’ve been dampened just so. Push the start button and the car sparks to life. It’s a quiet start, though, and one that would go unnoticed if you didn’t check the tachometer. 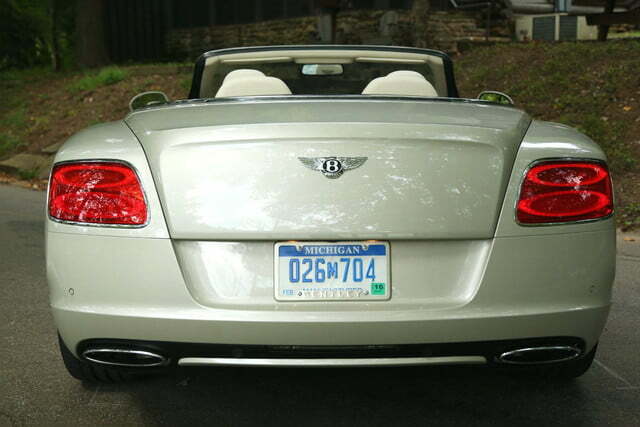 There’s no loud grumble from the exhaust, no vibration from the engine. That alone is a feat of engineering, since the folks at Bentley have shoehorned a 6.0-liter twin-turbo W12 under the hood. Around town, the GTC is surprisingly easy to drive. Dare we say that it’s not altogether different than driving an Audi A8, except that you can’t have the Audi as a convertible. There’s not much of an exhaust note, but that’s intentional. Who wants to be knocked around by a crackling exhaust in wine country, after all? 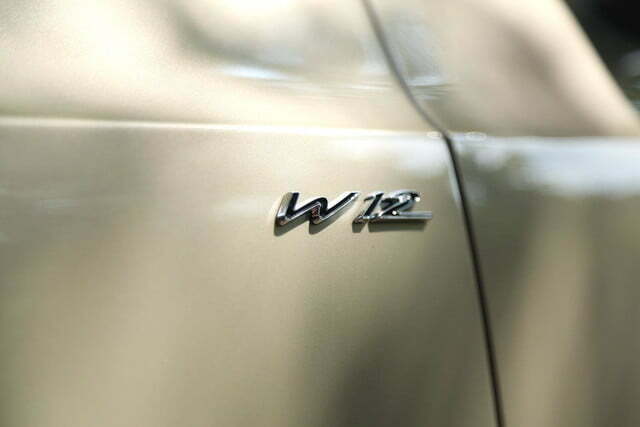 Despite its hushed note, the 567-horsepower W12 is no slouch. It’s paired to an eight-speed automatic and an all-wheel drive system that allow the GTC to be both incredibly quick and sublimely smooth in just about any weather condition. The suspension, however, is soft even in its sharpest setting. 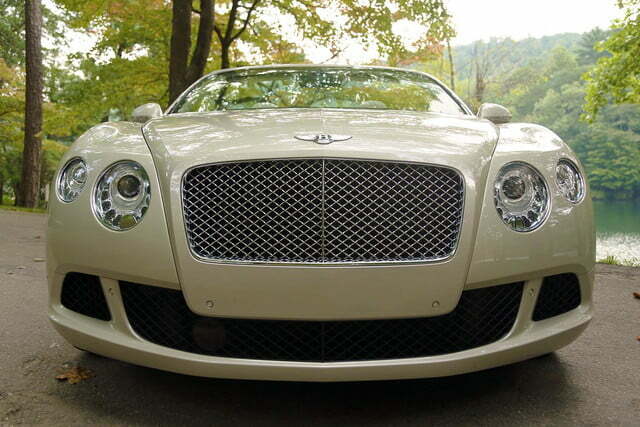 While the Continental may be the sports car of the Bentley lineup, it’s not a track car. It happily bounds through sweeping arcs on highways, but there’s an uncomfortable amount of body roll to really tackle sharp corners at high speeds. To that point, it’s the probably the perfect car for those long stretches of flat highway. 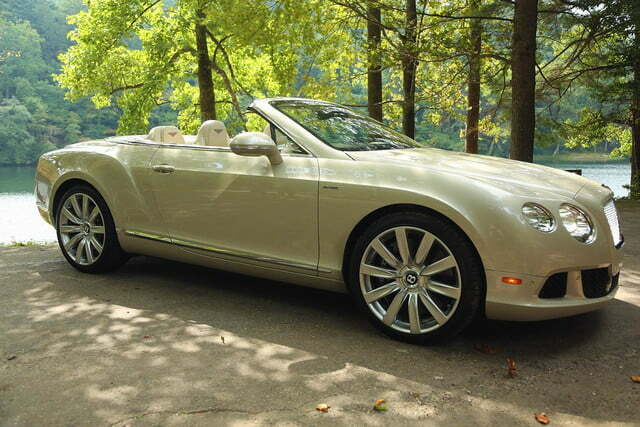 Those keen on mountainous excursions, though, may prefer an Aston instead. 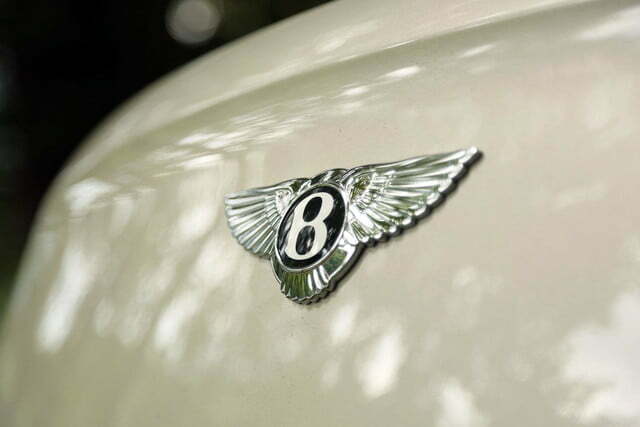 Still, perhaps the greatest joy of driving a Bentley is actually being seen in it. 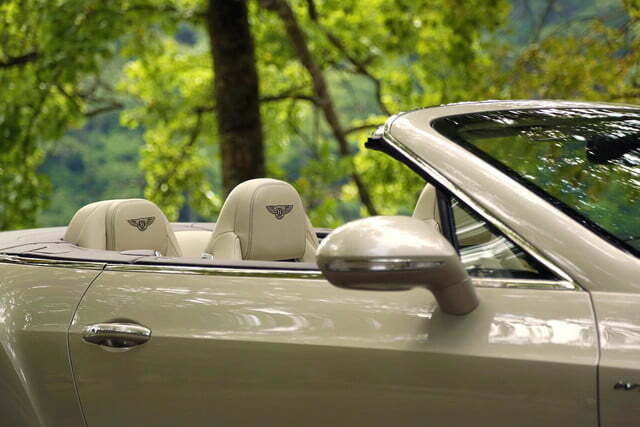 And, since the ‘C’ in GTC means convertible, it means that it’s easy to see who’s behind the wheel. It’s the kind of experience that’ll make you feel important – expensive – and with so many people looking; you may find yourself guessing at which celebrity you think they think you are. In my case, I think most passersby just assumed I had borrowed Dad’s keys for the weekend, though I did trick one guy at a gas station into believing that I invented the Snuggie. 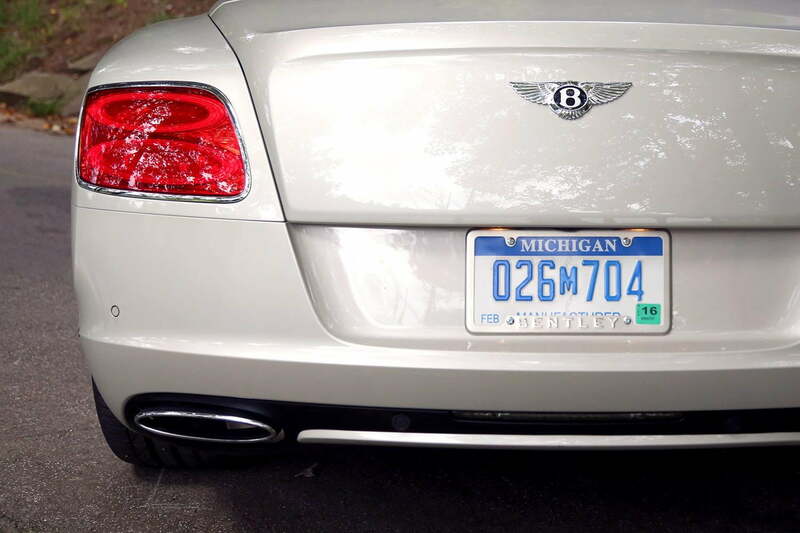 And that’s exactly the power that a Bentley wields over people, too. Such a tangible display of wealth isn’t an easy thing to fake. Just about any story is halfway believable when you’re behind the wheel of a Bentley. Since the car was pulled back into the press fleet, those images of wealthy entrepreneurship are again just a distant dream for me. I’m left with the memory of supple leather, immense power, borrowed self-importance, and the onset of one nasty head cold.